Explanation: The robotic rover Opportunity sometimes passes small craters on Mars. 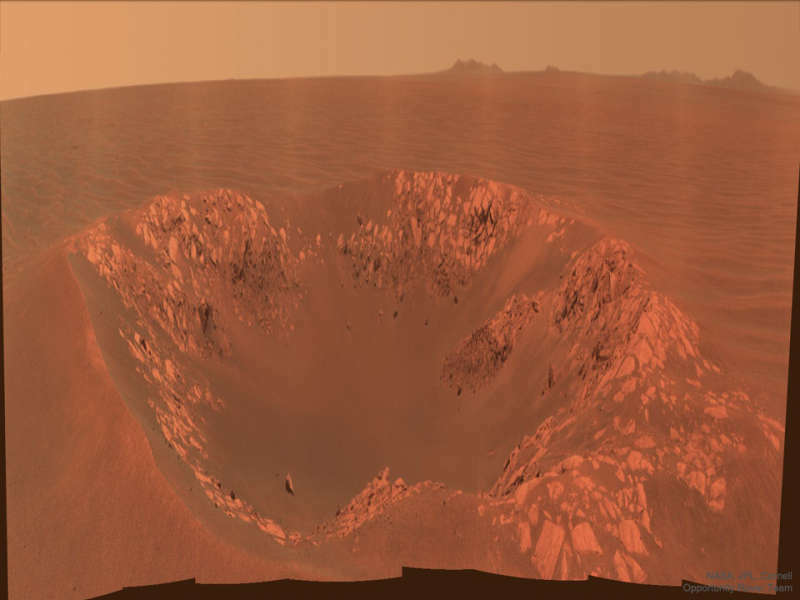 Pictured here in 2010 is Intrepid Crater, a 20-meter across impact basin slightly larger than Nereus Crater that Opportunity had chanced across previously. The featured image is in approximately true color but horizontally compressed to accommodate a wide angle panorama. Intrepid Crater was named after the lunar module Intrepid that carried Apollo 12 astronauts to Earth's Moon 49 years ago. Beyond Intrepid Crater and past long patches of rusty Martian desert lie peaks from the rim of large Endeavour Crater, visible on the horizon. The Opportunity rover continues to explore Mars, recently surpassing 5,000 Martian days on the red planet.